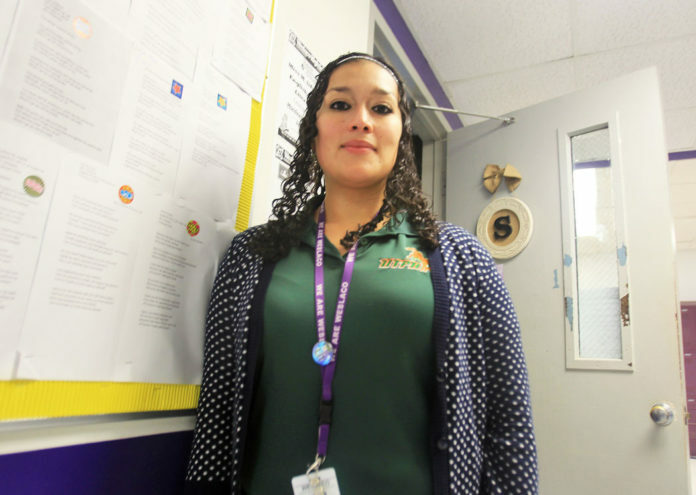 Teacher Monica Sifuentes poses outside her classroom at Weslaco High School on Wednesday, Feb. 21, 2018. WESLACO — In her 10th year of teaching for her hometown district, Monica Sifuentes of Weslaco ISD received statewide recognition by the Texas Council of Teachers of English Language Arts (TCTELA) as high school teacher of the year. While pursuing a master’s degree at the University of Texas Pan American (UTPA), Sifuentes, 31, began a student-teacher program that led her back to her alma mater. She was encouraged to apply by a teacher she worked alongside who was relocating to another district; she did so and landed the job. In addition to teaching Advanced Placement, Dual Enrollment and remedial classes, Sifuentes coaches UIL for Ready Writing and Journalism. A former student of hers placed third at the state UIL competition in Ready Writing. She’s a student herself, pursuing an Ed.D. in curriculum and instruction at the University of Texas Rio Grande Valley (formerly UTPA). Juggling those responsibilities has been challenging for Sifuentes. Sifuentes was nominated for the award by Associate Professor Amy Cummins, who has hosted panels at UTRGV. The conference took place in Galveston and Sifuentes capitalized on the opportunity to network with fellow teachers and gain ideas for new curriculums. Since childhood, Sifuentes recalls being surrounded by books. A weekend ritual she often looked forward to was visiting the local Kmart on weekends with her father and two elder siblings to drink coffee and juice and scan new books. Some teachers she’s met with don’t believe learning should be a fun task; Sifuentes feels otherwise. “I think we just need to find an angle of appeal,” she said. In giving students a say in what they want to read and learn about in class, she draws engagement. Another method employed is to keep parents informed of their child’s progress. Dialing her students’ home to alert the household of outstanding performance, not just negative behavior, is an approach she uses to focus on the positives. Sifuentes said she is grateful to work in a district that allows for creative liberties, such as allowing more freedoms in instruction. The walls of her classroom have been repainted and desks are grouped together to better serve her activity-laden form of teaching. One wall is almost completely lined with shelves filled with books collected from thrift shops and half-priced book stores in attempt to “spruce up” her assortment. The collection serves as a community library and Sifuentes encourages her students to pick up and take home any book they may be drawn to with no permission required. “In good faith you can return it, or if you really like, you can keep it,” she tells her students. After obtaining her additional degree, Sifuentes intends to remain teaching in the district and is often met with befuddlement from students who question what else she plans to do. “I love literature. I love writing. I love my students,” she responds. “I’m doing what I was born to do.